This article contains affiliate links. If you click and make a purchase I will make a commission at no extra cost to you. This article was first published on June 28, 2017 and updated in February 2018. 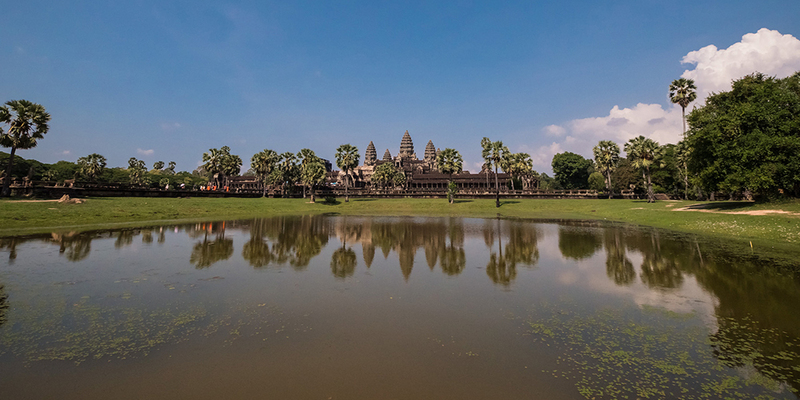 The bustling city of Siem Reap is a gateway to the mystical ruins of Angkor Wat. Glancing the ancient temple of Angkor Wat before sunrise will give you the chills – the good ones. The people will leave you smiling and the temples will mystify you. Take the 2pm flight from Singapore. 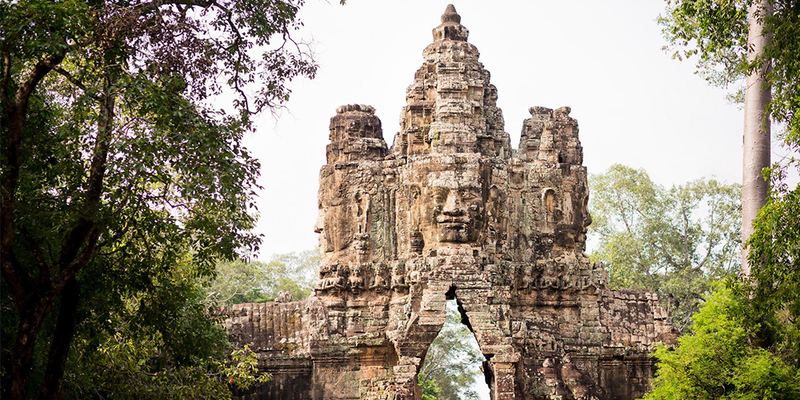 With a one-hour time difference and a 2h flight you’ll arrive in Siem Reap at around 3pm. Remember to bring US$30 in cash and a passport sized colour photograph in order to obtain your visa on arrival (if you are eligible). If you want to enjoy mobile internet, you can buy a local simcard outside the airport to your right, from the Telco booth. They sell different data plans depending on how long you’re going to be there for. In any case, there is (good) free wifi all around Siem Reap, so you should be fine without a SIM card if you only need occasional connection. Taking this flight leaves you enough time to hop on a tuk tuk or get into your hotel pick up car and buy your 3-day Angkor Archeological Pass for US$62 on your way to the hotel to avoid the queues the next morning. The Ticket Office, which is about a 20 min ride from the airport, closes at 5:30pm daily. After settling into your hotel, you can get in touch with the reception or concierge to organise a trusted tuk tuk driver and guide for your visits the next day. A short ride will cost you about US$3-7 depending on where you’re going. A longer excursion will come to about $15-20. Tipping is not mandatory but is always greatly appreciated. You can of course do this ahead of time with the hotel but you can also organise it when you get there. It is not worth it to flag a tuk tuk driver and start bartering with him at ungodly hours. 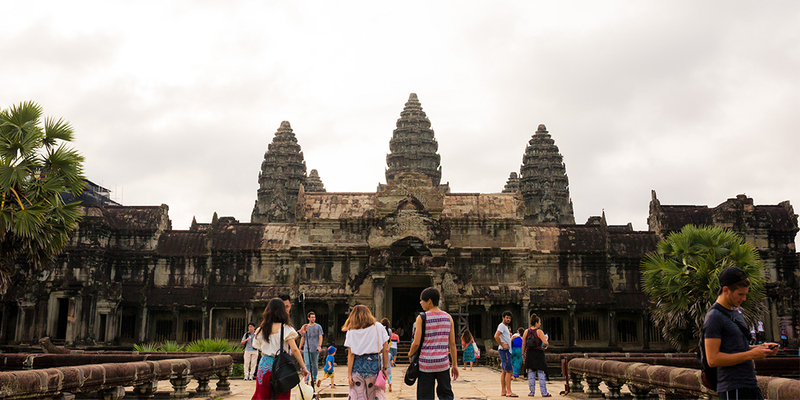 Although there are a lot of temples and tours you can take, most visitors staying for a shorter 2-4 days will usually venture out to cover either the “small” or the “big” tours. The names refer to the length and distance covered. We recommend starting with the small tour, where you will get to see the major temples of Angkor Wat, Angkor Thom and Ta Prohm and asking for the sunrise on Angkor; cliché it may be, but it is still stunning no matter how many photos of it in all the varying degrees of light and cloud cover you may have seen. If you are well into architecture, Buddhism, Hinduism and history, the bigger tour might be more your cup of tea. Once all is sorted, you will probably be hungry and keen to get a first flavour of Siem Reap. Take a bite to eat at The Touich Restaurant, which is a little known and off the beaten track eatery (off the beaten track in that it is not on the main Charles De Gaulle Road). 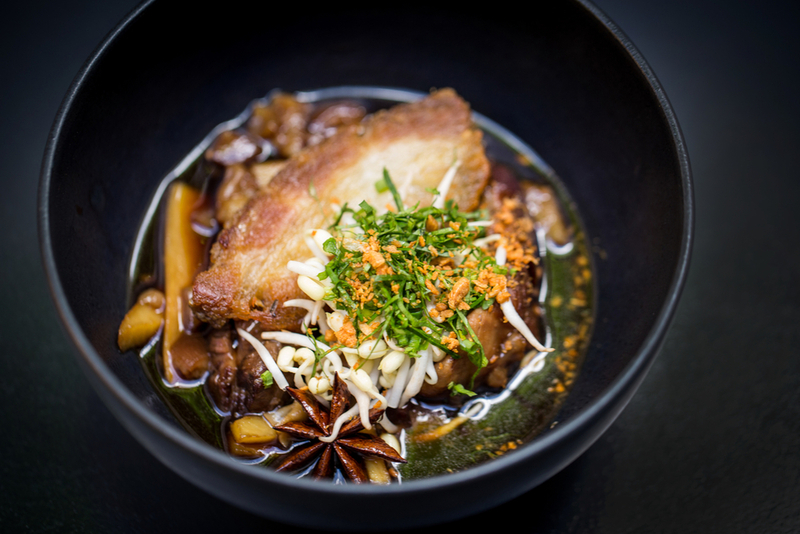 The pork spare ribs will make your mouth water and the quiet, spacious area will have you relaxed and meditative. Take a 10 minute stroll along the Siem Reap River to Peace Café for a vegetarian dessert. Choose from their selection of cakes and cookies for a healthy yet tasty treat. It’s located on East River Road and is open till 9pm, perfect for your early bedtime. Back at your hotel for the night and in preparation for the early start, pack all the bags ready to go. Get your sunscreen, shawl for cover (you cannot have bare shoulders or knees in the temple complex, men will also need to cover their shoulder and wear longer shorts) insect repellent, water and snacks ready and don’t forget to charge all your electronic devices. If you are a mobile photographer, bringing an extra battery pack might be wise, there will be lots of photo ops! Get an early night, you’ll need all the energy you can get for all the walking and mind-blowing sights you’re going to see tomorrow. Sleep tight. Today is the day you’ve been waiting for. So get excited for a plus minus 6-hour long trek throughout the ancient city of Angkor and its temples. 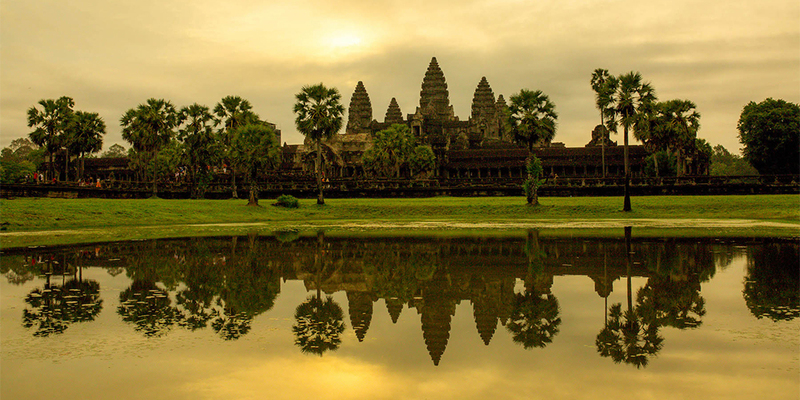 Wake up before sunrise and hop on your tuk tuk toward Angkor Archeological Park, where your first stop will be Angkor Wat and one of the most beautiful sunsets in the world. The small tour will take you to the megalithic Angkor Wat, the 216 smiling faces of Angkor Thom, Ta Prohm of Tomb Raider fame, as well as Srah Srang and temple Banteay Kdei if you so choose. Here is your itinerary of things to see in Angkor Wat and surrounding areas. 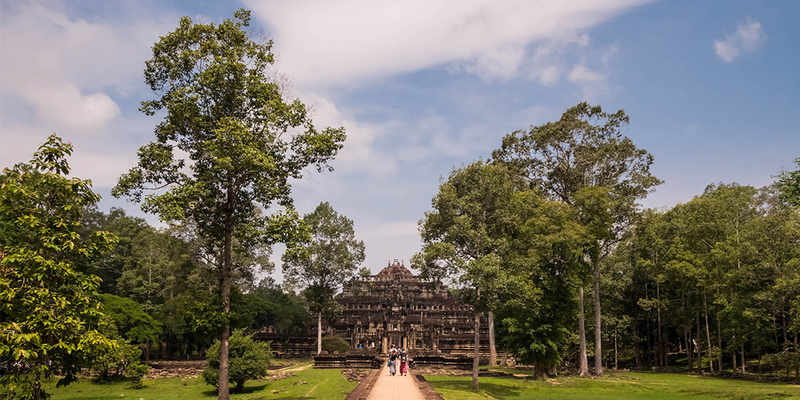 As you ride into the Angkor complex, savour the moment as it is something profound. In winter, sunrise is at around 6:30am, so you have a bit more time to sleep in. Summer sunrise time is about 5:30am. Allow yourself 30 minutes before sunrise to get to Angkor Wat and hold down a good area to capture the sunrise with your camera. The good places fill up very quickly in peak season. Best places to capture the sunrise are from inside the complex just in front of either the left or right pool. It will be obvious when you see it, and you can have a look at our photos to understand the best angle. After taking your sunrise pictures, retrace your steps back to the entrance. Then take a glimpse the bas reliefs that line the outside of the central temple complex and which depict military scenes and stories from Hindu mythology. Try to visit the clothed statue of Vishnu to the right as you enter the complex, which you should not miss. Take in the smell of incense and feel the power of the Gods as you look up at the monument with eight arms and umbrella overhead. Once the sun is up and you have contemplated it rising and shining over the temple complex, walk the half a kilometer avenue to the main structure. Clusters of hawkers will try to sell you books on Angkor Wat and Cambodia as you stroll through the crowds. If you have some dollars, you might as well buy one or two, but only from adults. The books are legit and have some great information in them if you don’t have a guide. Yet having a guide is definitely the best way to explore Angkor Wat, otherwise you’ll miss out on the extraordinary history. You’ll pass trigger happy selfie taking tourists and orange robed Buddhists monks. Note that there are temples on either side of the avenue where practicing monks abide. Entrance into Angkor Wat for the Khmer is free. You’ll reach the center with a massive smile on your face. Inside, you will see several monks sitting on mats. If you sit in front of them (cross-legged or kneeling) and put your hands together, they will offer a blessing. Remember you leave a donation in the box. Take the steep wooden ladder to the top of the three storey tower. Show your pass and climb up to take in the majestic views 65m above the ground, a sight to behold and store in your memory. Looking at the view and the calm surroundings is one of the best things to do in Angkor Wat. Next on the list of Angkor Wat temples to visit is Angkor Thom or Grand City, a series of monuments and temples that depict ambitious King Jayavarman VII’s embracing of both Hinduism, Buddhism and Animism. You’ll most likely (and should definitely) enter through the South Gate. Here, the four smiling faces, that represent both Buddha’s states of mind (compassion, sympathy, charity, equanimity) and Brahma the Creator, will take your breath away. Be sure to check out the 54 gods and 54 demons all pulling Naga (the snake) as they churn the ocean of milk. 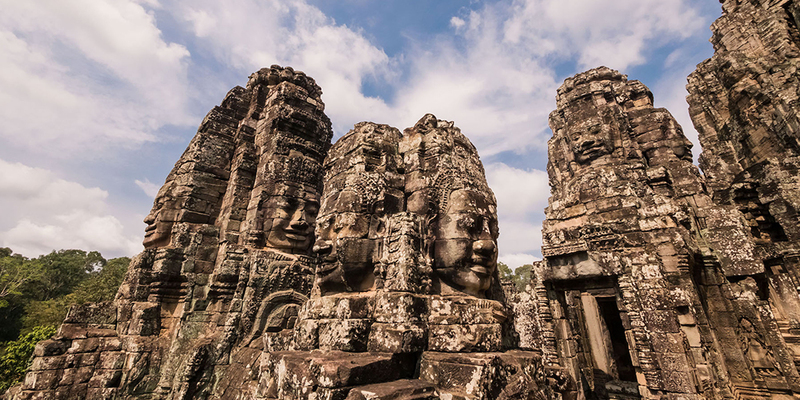 Inside the 3km by 3km complex, you’ll visit the 216 smiling faces of the Bayon temple in Angkor Wat. You will feel like royalty walking the corridor toward the Baphuon, a representation of Mount Meru. This structure was the epicenter of the city before Jayawarman VII constructed Angkor Thom. Angkor Thom complex is said to have been constructed around this site. Baphoun was built dedicated to lord Shiva and has a large corridor with three entrances. The middle entrance was for the king, and the side entrances were for the common people. Marvel at the antiquity of the Phimeanakas Temple meaning “palace” and aka “plaza” or “Celestial Palace”. It is a 600x300m structure that housed the royal palaces. There’s a nice view of Baphuon from the second and third levels. The grand Terrace of Elephants is a 350m long platform adorned with elephant carvings (and some mahouts), this is where the king sat and watched the royal performances and military processions. The Terrace of the Leper King is a 7m platform to the north of the Elephant Terraces. There are various explanations for this statue. One is that a king got leprosy and went to the jungle by himself to heal, but never came back. This structure is therefore an ode to him. Another theory is that it is a statue of the death god, Yama, and was therefore used as a crematorium. The Prasat Suor Prat where ropes were once tied between the towers so that acrobats could perform for the king. And now comes our personal favourite, Ta Prohm. Although it is the most popular attraction after Angkor Wat as a result of Angelina Jolie falling through the earth here in Tomb Raider, it is still mind-blowing and awe-inspiring. Snap a shot of the gigantic trees that grow through the complex and try find the images of the smiling Buddha that are hidden behind the roots of the trees. 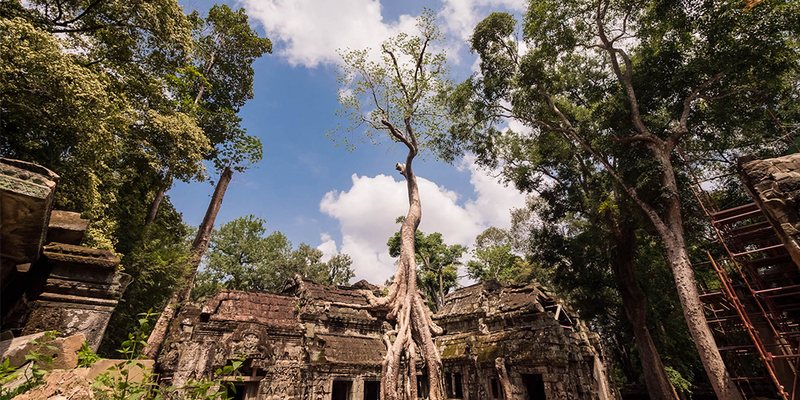 Ta Prohm’s magic lies in the majestic nature overtaking the structure. 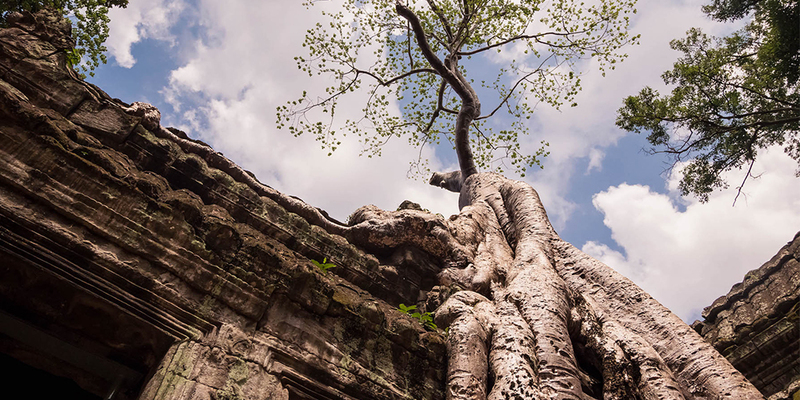 Look out for roots growing through the temple walls, trees flourishing in ancient temple rooms and towering branches above your head. It truly is mesmerising. After a very long half-day of walking, sweating and all out awe, head back to your hotel for lunch. If you prefer to eat out, you can also have lunch in a traditional Khmer village in the Srah Srang area, which can be organized though MAADS. This is a once in a lifetime opportunity to eat in a local Khmer house with locally sourced and cooked food by a real family instead of a fancy chef. Alternatively, you can tickle your tastebuds while helping out a good cause at HAVEN, next to tomorrow night’s dinner option Cuisine Wat Damnak. This hotel trains Cambodian youth to work in the restaurant industry, providing them with work. The staff are friendly and professional and serve an array of fresh, no MSG fare with a Cambodian fusion flare. Choose from an “Asian” or “Western” main and a tasty dessert. After lunch, chilling at your hotel will be a welcome thought. Swim, sunbathe, have a siesta and dream of Apsara dances and Hindu/Buddhist mysticism under the warm Angkor sun or the shaded trees. 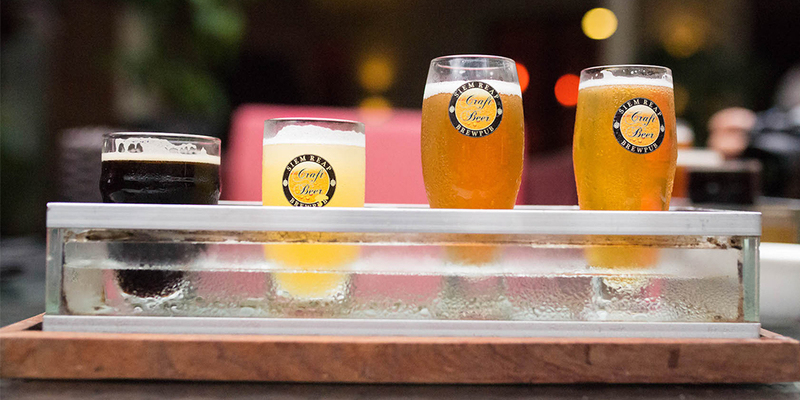 Shower and get ready for some beer tasting at Brewpub, Siem Reap’s only Micro Brewery. The vibe there is very chilled and the beer is great and cheap. The finger foods are also wonderful, serving a blend of local and Western fare from prawn skewers to cheeseburgers. Try the beer tasting with four different styles of brew, choose from a Blonde Ale, Golden Ale, Saison, Honey Weiss, IPA and Dark Ale and have a game of darts in the spacious area. If you’re asking yourself what to do in siem reap at night, well, there are loads of fun activities. You can take a nice walk over the Siem Reap river for about 15 minutes or hop on a tuk tuk for a 5 min ride (about $2) to Por Cuisine for dinner and a wonderful Apsara show. The performance here is fun, with a young cast of dancers. Don’t expect acrobatics (that’s reserved for Day 3), but do expect an enjoyable atmosphere and some delicious local food. 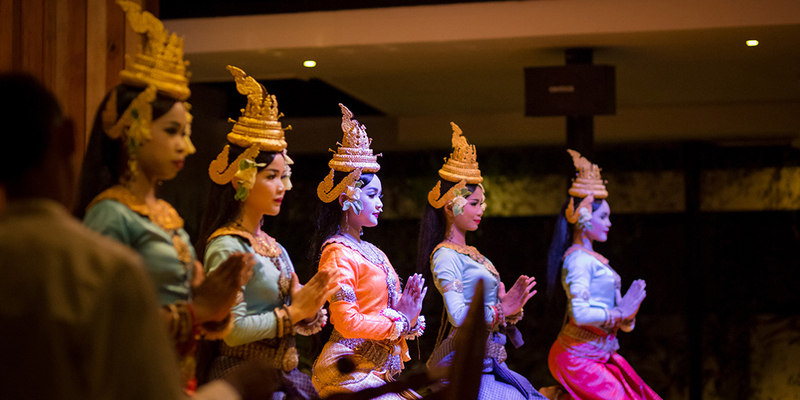 Eat as you watch the traditional Apsara dancers perform the skilled dance. Book ahead to avoid disappointment. Performances are daily from 7:30 and 8:30pm and the set menu is $20. It’s now back to the hotel for another early night. Unless of course you want to venture into Pub Street’s jungle of bars, beers and (male) bare chested tourists. For a more stylish option choose Miss Wong Cocktail Bar where you’ll get one of the famous cocktails for about US$5. Go with the Miss Wong Punch for a rum fuelled frenzy or the gin based China White. Imported wines are also available. It’s open from 6pm till late every night and is located in the Lane between 7 and 8 Street. If you’re looking for more of a pub style joint, hit up Banana Leaf Restaurant & Bar. You can’t miss it as it’s one of the first bars when you enter Pub Street on the 2 Thnou Street side. You’ll find live music, friendly staff and well-priced drinks along with some great pub snacks. It’s also open from 9am to 1am every day, so you can get your fix almost any time of the day. There are also many rooftop bars to choose from, but we loved Garden Village Guesthouse for its relaxed atmosphere, cheap beer, pool tables and a great views, especially to watch the sunset over the hustle and bustle of Phnom Krom. It’s situated near Old Market on the corner of Sok San Road and the aptly named Funky Lane. Other popular options include Purple Mangosteen, Terrasse des Elephants, and X-Bar all very close to one another. Don’t worry if you can’t get to all of them, you’ll have the rest of the your time in Siem Reap to visit. Wake up fairly early for another big day of temples and wonder. Today is the Grand Circuit (or Big Route), which isn’t named after the size of the monuments, but rather the distance traveled (26kms as opposed to 17kms of the Small Circuit). Now is your chance to explore all the lesser known, but in no way less spectacular temples of the Kingdom of Angkor. One of the most spectacular sunrises on the Grand Circuit is Preah Rup. Note that you will need some time to summit the stairs depending on your fitness level, but the view from the top is a spectacular blend of jungle and temple. Head to Preah Rup for sunrise and go to Banteay Srey, Eastern Baray and East Mebon, Ta Som and finally Preah Khan. This circuit should take about the same amount of time as the Small Circuit as you’ll probably spend less time at each site because they are smaller. The Grand Circuit is for those explorers who want to get away from the crowds of the main temples like Angkor Wat and Angkor Thom, but who still want to experience the grandeur of the ancient Khmer empire. You will be amazed by the intricate feminine carvings of Banteay Srey, the gorgeous elephant statue at East Mebon and Ta Prohm’s little brother Ta Som. Two more temples constructed by Jaywarman VII that are awe-inspiring and a bit less crowded than those at Angkor Thom and Ta Prohm. Preah Khan (“Sacred Sword”), much like Ta Prohm is covered in towering trees, displaying its megalithic roots, particularly on the outer wall of the east gate (tourists usually enter at the west gate). Head over to Neak Poan, which is called “Intertwined Naga” which are clearly visible in the center of the central pool. It is a Buddhist temple that is surrounded by pools, so it is essentially an island. The tour will take about 6 hours, so bring some snack and loads of water. After visiting the temples, it’s time for some lunch. Make your way to L’Annexe French Restaurant for a hearty French steak lunch. They serve Parisian fare with a twist like beef tenderloin with Kampot pepper sauce, grilled sirloin, pork filet mignon, braised lamp’s rack and foie gras. It is open on Mondays from 4:00pm to 10:30pm, but from 11:30am to 10:30 pm for the rest of the week. It’s located 108 Sok San Road, about a 15 minute walk to your next destination, the Made in Cambodia Market. This is the place to find authentic Cambodian goodies, not the cheap stuff that is made elsewhere. The stalls catered for every interest and every budget. It is usually open three days a week from 12pm to 10pm, but dates and times do fluctuate in and out of season. Check their Facebook page for the latest opening slots. You can make your way back to Phnom Bakheng if you want to get an epic sunset shot of Angkor Wat from a different angle. Built during King Yasovarman I’s reign, this Buddhist and Hindu structure running up a hill is a popular spot for watching the sun go down. It is around 1.5km away from Angkor Wat. It gets busy at sunset, but the view is spectacular. After some rest, head to the popular Cuisine Wat Damnak for an early dinner featuring a French take on traditional Khmer dishes. Enjoy the daily degustation menu or choose from the a la carte selection. Cuisine Wat Damnak is open between 6:30-9:30 from Tuesday and Saturday, booking is essential and can be done up to 90 days in advance online. Take the 1km stroll to some late night shopping at the Night Market just over Sivatha boulevard. It closes at 12am officially, but may close earlier in off peak season. Then cross Sivatha Boulevard to access Pub Street (a 3-minute walk) and enjoy a cocktail at any of the pumping and vibey bars mentioned earlier. You won’t be able to do them all in one day, so now is your chance to explore the area a bit more. Have breakfast and get your cooking skills ready because today you’ll be cooking some local Khmer cuisine at a luxury hotel (2 birds, yay!). 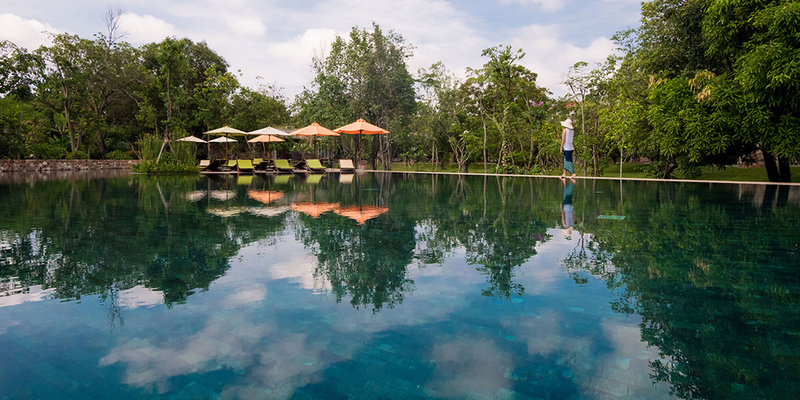 You’ll start your foodie journey at Templation resort, the closest resort to Angkor Wat and one of the most beautiful. You’ll be welcomed by head chef Toek Menghout before being driven in an air conditioned van to either the local farm or market (the selection is weather dependent as rain floods the roads making the farm inaccessible). 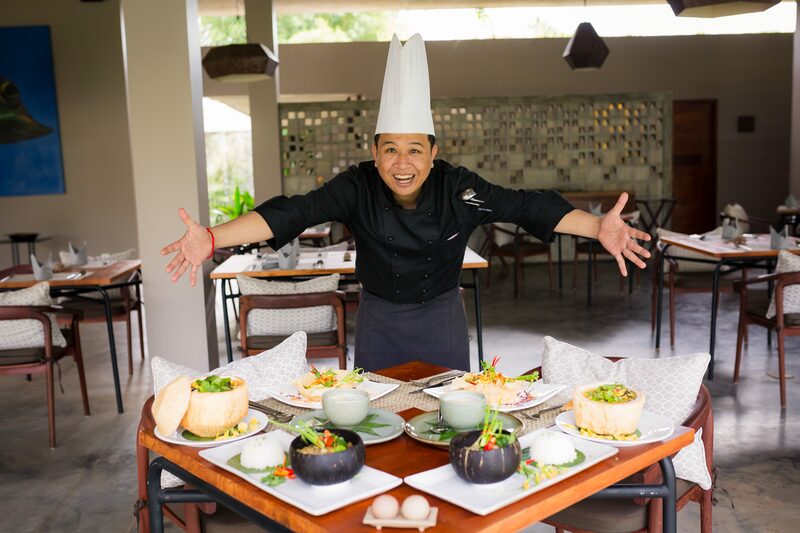 After viewing the local produce and seeing where the Khmer people shop, you’ll go back to the hotel to start your cooking class by the enormous pool. The chefs are so knowledgeable in the local cuisine and so friendly that the experience is just fantastic. They will constantly bring you ice cold towels and refresher drinks to stave off the heat. You’ll get to know how to make local fare such as fish amok, char kroeung, lok lak and some desserts to boot, like tapioca pudding. Fish amok is a sort of fish mousse made with fresh coconut milk, slok ngor (a bitter local herb), and kroeung which is a distinctly Khmer curry paste that has flavours of lemongrass, ginger, and turmeric. Char kroeung is basically stir fried meat in kroeung. Choose from pork or chicken and be delighted. Similar is the block shaped lok lak that is garnished with lettuce, tomato, and other seasonal veggies. While the menu is set, let the chef know before if there are any other dishes you’d like to try and make, they are very accommodating. After receiving your certificate, the magic comes. Sit down in the open air restaurant and relax while you finally get to enjoy what you just cooked. Through chef Menghout’s guidance, your food is properly delicious. Have a Brewpub beer or a very reasonably priced wine with your food and then relax by the pool while your food digests. Classes are $25 pp, totally worth it for half a day of travel, cooking, eating and chilling by the pool. You can then have a quick 15 minute massage at the Bodia Spa, an extension within Templation. Massages are not included in the price of the cooking class, for rates and types check their website. There are so many other things to do in Siem Reap apart from temples. So, say goodbye to Templation and head to Kandal Village for a late afternoon coffee. Located on Hap Guan street, Kandal village is as hipster as you’ll get in Siem Reap without the pretentiousness and by far one of the best places in Siem Reap outside the temples. In fact, almost every boutique store on this small strip has connections with a charity. Try out some sunset yoga with Azahar Center for Peace, the only all-Cambodian yoga studio that teaches less fortunate Khmer young adults how to practice and then teach yoga. 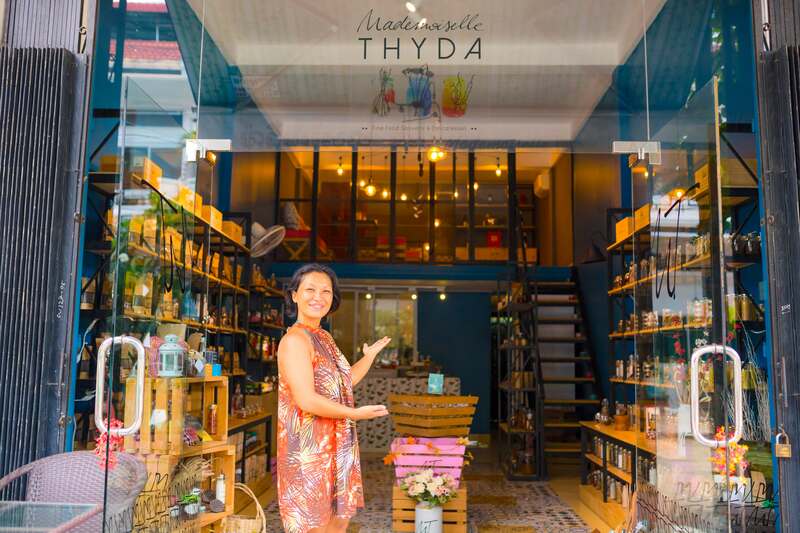 Head on to only-locally-sourced produce boutique Mademoiselle Thyda, where after purchasing some tea and spices you can also try out some French wines. Then have a tasty coffee at The Little Red Fox Espresso. You can either visit Angkor Wat (from outside the gates as the main entrance will be closed in the summer months), Phnom Bakheng for your final sunset over Siem Reap. But if you want a more peaceful place to watch the sun go down, you can head to Bakong, part of the Roluos group, the earliest of the Khmer temples. It is about 13kms east from Siem Reap central. After sunset, it’s time for the big finale as you experience the Cirque du Soleil of Cambodia at Phare. Tickets range from US$18 to US$38 for adults and between US$10 to US$18 for children depending on the time of year and your seating option chosen. Phare is one of the most famous performances in Siem Reap and an extension of the NGO school Phare Ponleu Selpak Artistic Center in Battambang. You will be blown away with this highly rated original performance that includes dance, acrobatics, circus and art. Book ahead of time for convenience, nightly performances from 8pm. Here’s a taste. Today is your last day and it will be a quick and cultural one. We suggest heading to the Cambodia Landmine Museum for a humbling and edifying experience. This museum tells the story of Aki Ra, a Khmer man who was forced by the Khmer Rouge to lay landmines throughout his own country. Later on he made it his sole effort to clear up these deadly devices of destruction and your $5 entry goes directly to this cause. Open daily from 7:30-5:30pm and located 6km south of Banteay Srey. If there’s time, you can also choose to visit the traditional silk workshop at Angkor Silk Farm if you want to see the workings of an authentic silk farm in action, it’s pretty amazing to witness. It’s open daily from 08:00-17:00 and is located just West of the East Baray, about 20 minutes from the airport. Or you can go on a visit of Tonle Sap Lake. We went a few years ago and we were heart broken by the reality. Read more about the tour and make up your mind. Head back to the airport at 1:30pm and fly back to Singapore. 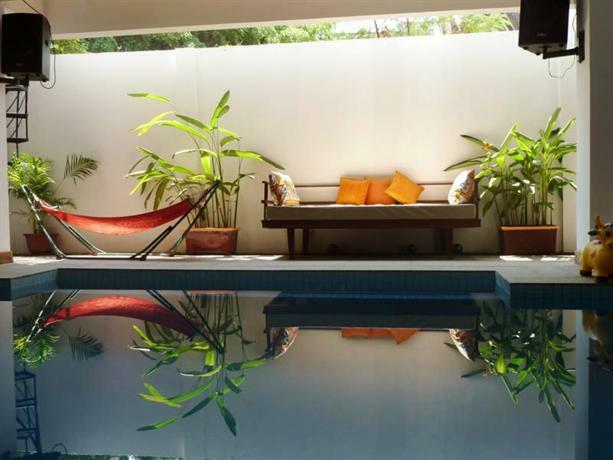 If you’re backpacking and your wallet isn’t stretching far, make a stop at Siem Reap Hostel. With free wifi, a poolside bar and even a yoga room, sharing a dorm will be your cheapest option at $5 a night but there are private rooms available from $12.50. 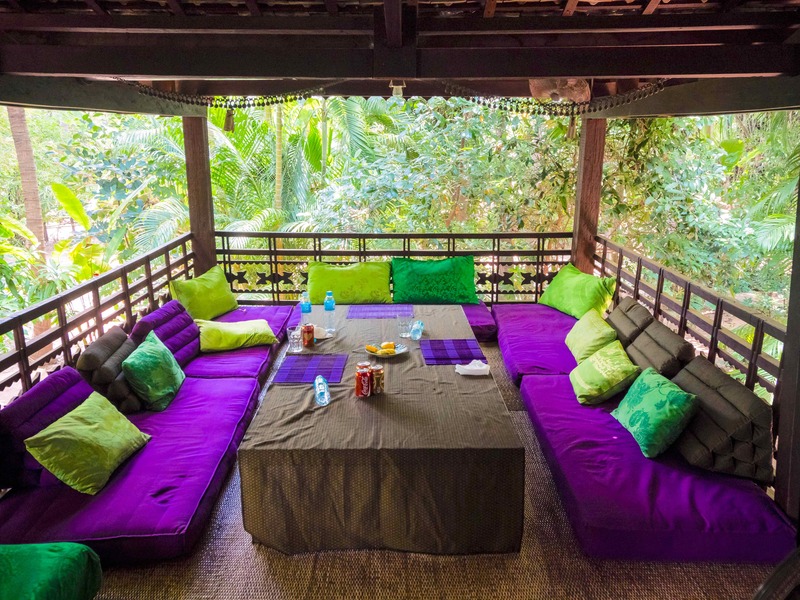 Another option is self-proclaimed (on their website) best hostel in Siem Reap, Mad Monkey Hostel. With an outdoor pool and a dorm ($9) and private room option (from $25), you will want to stay at Mad Monkey if you’re looking more for more of a party vibe than to connect with other travelers. For a little more than the cost of a hostel, stay at an actual hotel with pool and facilities. Baby Elephant Hotel is known for their five-star service and delicious (free) breakfasts. Arrange a tuk tuk driver through the hotel to avoid hassle. Relax by the pool after sweating the entire day with a $1 draught beer. Prices range from about US$26 for a Budget Twin to $60 for a Deluxe Family room per night. For your affordable lux option, we would highly recommend Templation, a MAADS resort. We were fortunate enough to stay there and from the start it was nothing but perfect service led by proficient manager Ayub, scrumptious delights from head chef Toek, and just pure relaxation. It is eco-friendly, socially responsible and the free Bodia cosmetics (including the insect repellent) as well as the complimentary breakfast were a nice touch. 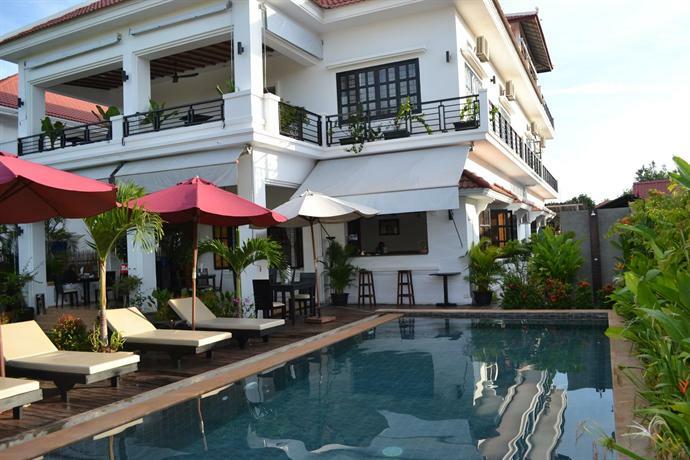 It is also one of the more affordable luxury accommodations in Siem Reap and a fantastic value for money option. Rates start from US$148 for a Junior Suite, $258 for a Pool Suite and $358 for a Pool Villa per room per night. 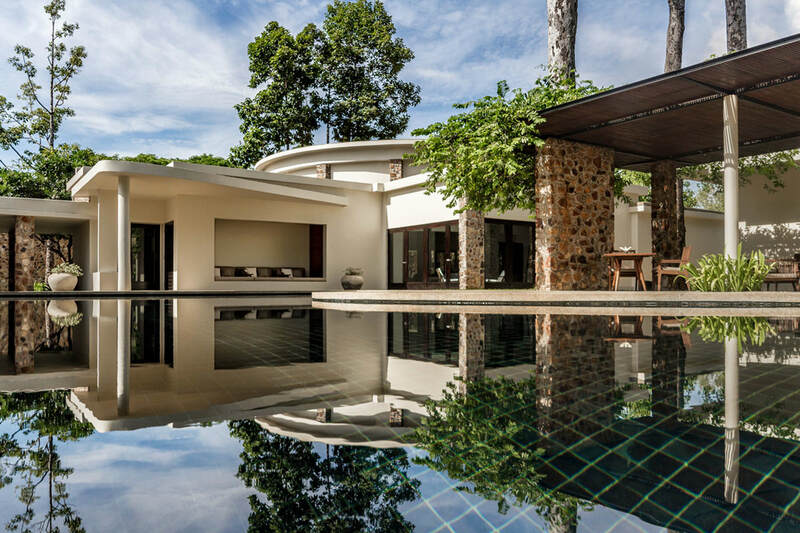 If you want to go super luxe, be sure to go all out at Amansara for US$1,420 for a suite or $1,940 for a Pool Suite. They will take the thinking part out of your trip and design an itinerary according to your every need. Staying here will surely live up to your Aman standards. From Singapore, you can make the 2-hour flight directly into Singapore with Jetstar and SilkAir. For a longer flight, you can take AirAsia through Kuala Lumpur or Bangkok, total 7 hours. Once you are in Siem Reap, it is easy to explore the city by tuk-tuk. It costs around US$30 a day to hire one with a driver, perhaps more if you travel farther and between $2-$4 for shorter drop-offs. The driver will wait for you at each site, so remember the name and number on the side of the cart – take a picture with your phone as it is easy to get confused with so many of them around. Always negotiate the fare before getting into the tuk-tuk to avoid having to argue on arrival. Keep small notes with you as change is hard to come by. Siem Reap is usually dry from October-April, as the rainy season starts in May till end of September. The shoulder season in May gets Mango showers which is when it pours everyday at sunset for about an hour or two and it is clear for the rest of the day. During this time there were fewer tourists, and therefore less crowds to fight through but you may not be able to see any sunsets. Get your tickets on the day you arrive to avoid waking up at a ridiculous hour to get your ticket before sunrise, especially in summer. – Angkor Wat and Srah Srang: Daily from 5.00am until 5.30pm. 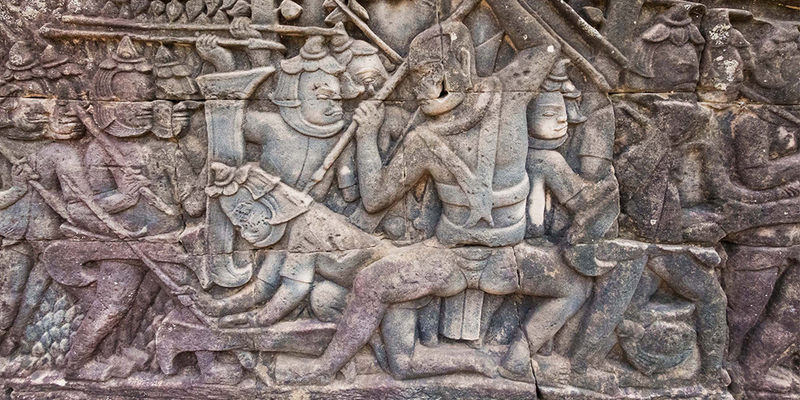 – Phnom Bakheng and Pre Rup: Daily from 5.00am until 7pm. – All other Temples: Daily from 7.30am until 5.30pm. Follow the rules and codes of conduct such as covering your shoulders and knees for men and women, not taking photos of monks (or anyone) without asking or screaming at or to your partner inside the temples. This is a religious monument, so act as you would in a Church, Synagogue or Mosque and respect the local culture. Your Angkor Ticket Pass will get you to most of the temples, except for Phnom Kulen and Beng Mealea. You will need to buy an extra ticket to visit these. Cambodia is sadly known for many scams related to begging children and orphanages as well as child trafficking and abuse. Do not to support this crime by giving money to children which encourges this business and them dropping out from school to beg, thus perpetuating the cycle. Rather support the adults so that they can bring the money home to their families. You can use US dollars or Cambodian riel – no matter where you are. But note that if you pay in dollars, you may get change in both currencies. On the streets, 4,000 Cambodian riel will get you one US dollar no matter what the exchange rate is doing on that day. Be prepared for a shift in your driving mentality. The middle of the road is used for cars to take over and the side is reserved for motorbikes and tuk tuks or slower cars. Unlike other SEA countries, Cambodians do not incessantly hoot but rather give a light tap of the horn only to warn other drivers, who will pop out of nowhere, and children crossing the road – on motorbikes. Yes, like your parents buying a shoe size too big when you were young so that you can grow into it, you’ll see children riding motorbikes that are also too big for them, sometimes with granny in tow or the entire family of four on one bike. Embrace the culture and relax, traffic accidents mainly occur from drunk drivers, so calm down and trust your driver. There are mosquitos everywhere, so rub, spray and douse yourself in repellent if you don’t like getting eaten alive. High factor sun screen, sunglasses and a hat are a must if you don’t want to look like a lobster. Bring a shawl to cover up in temples, men and women.